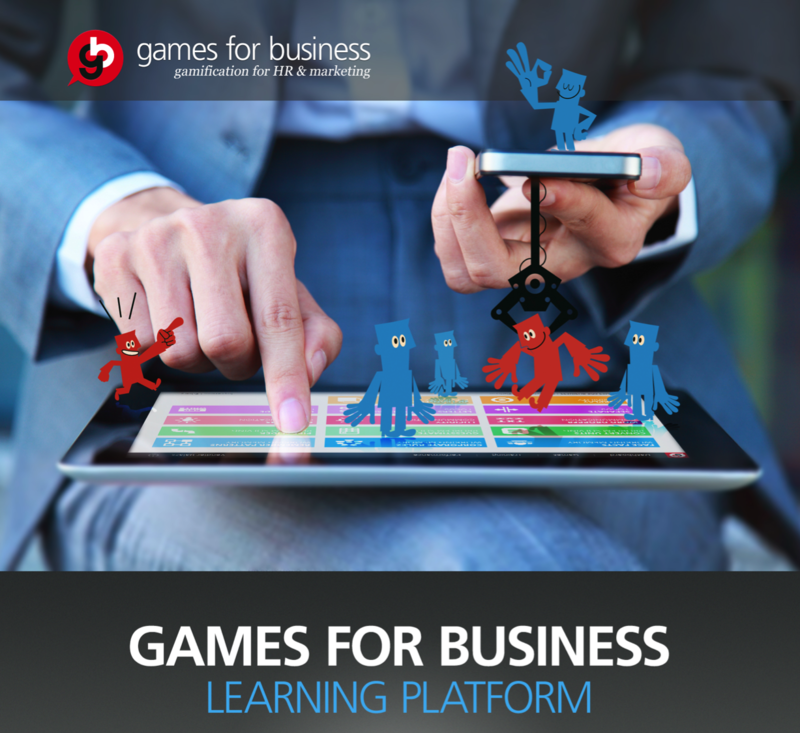 Games for Business Ltd. Develops a gamified learning platform. The predecessor of the company is a communications agency operating since 1999, with over 10 years of experience and international success in the area of HR gamification. In recent years, we have implemented over 70 projects and worked together with international clients, such as BP, HBO Europe, PwC, or Telekom. Several international businesses and professional portals (e.g. Forbes.com) have written about our projects. User habits and attitudes towards technology and tools have changed at a pace which the HR market did not manage to follow. Services that surround us are mobile, personalized, they apply peer-to-peer and gamification mechanisms, and provide instant, continuous feedback. Consequently, employee expectations are also different than they were a decade ago. Users want to take individual ownership and control of their learning and development. Our goal is to create a motivating corporate learning system, in which learning is not a task, but a continuous internal demand. Our platform transmits information and coaches behavior by operating with a multi-layered motivational mechanism that fosters a self-conscious attitude. Our user-validated and ready solution has a huge competitive edge because it reduces the risk for organizations that lack practical experience with the newest technologies. The platform is also simply adaptable to varying organizational situations and goals. The platform provides the software and methodological frame that is drawn up in the project goal. 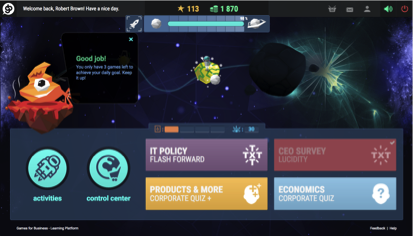 The gamified system bridges the gap between motivation and corporate contents, while it develops competencies relevant for the user. 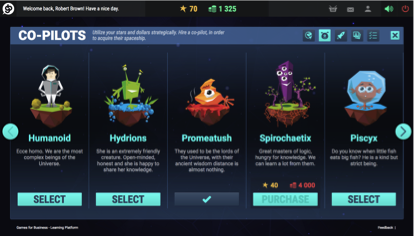 The essence of the complex methodology behind the Games for Business learning platform is that system is capable of transferring the client’s organizational information by engaging the user in continuous interactions. Development that aims at reaching the expected knowledge level is done with consideration for individual learners’ results. Our system combines the below methodologies. Users are motivated to use the system repeatedly. 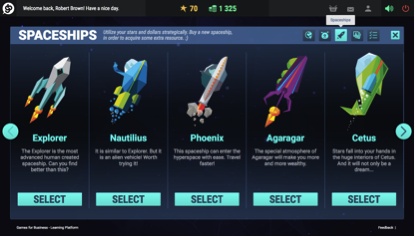 Virtual rewards, such as points, badges, and levels can be earned, which bring out the competitive nature of employees, and motivates them to overcome various challenges. This provides a significant advantage compared to other methods of training or learning. Mobile devices are always with you, always on, meaning that mobile information can be integrated into the normal workday. Mobile learning isn’t a different kind of learning; it’s providing people with the knowledge they need to be effective in their jobs by understanding how they are already using their mobile devices: in short bursts, during brief periods of downtime, and seeking information as close to the point of need as possible. Our system provides detailed and visual reports about corporate knowledge and cognitive competency levels, as well as user activity. This allows your organization to track results and continuous development, and also to compare the achievements of different employee groups. 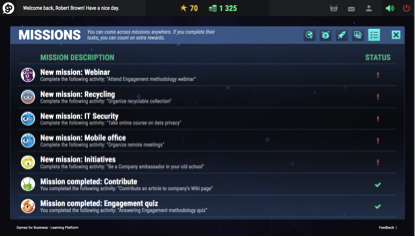 Organizations can define different categories of corporate information to appear in the game modules for relevant employee groups. Individual users follow their dedicated training program, but they always have choices and options to go further. 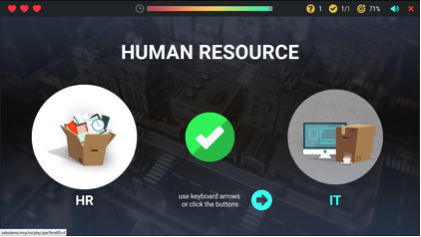 By applying gamification and using research results of cognitive psychology, we create a fresh, simple approach: employees train their brain by playing soft skills games, and they learn integrated organizational information, such as policies, colleagues, the brand, etc. Gamification is a scalable framework for motivating employees to engage in desired behaviors without any corporate push. With our game platform, training becomes voluntary. 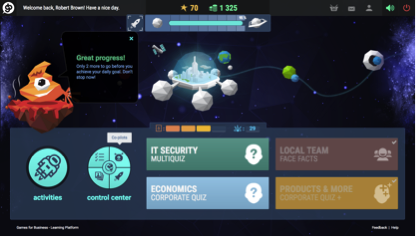 Learning module: The goal of the learning module is transmit organizational information and training contents by integrating them into various popular mini-games, making the learning process more motivating and efficient. Activity module: The goal of the activity module is to coach user behavior along the expectations and goals of the organization. Rewarding module: The rewarding module rewards various user activities with virtual and various physical rewards. Metagame module: The goal of the metagame (frame story) module is to strengthen internal motivation, to visualize progress, and to increase the emotional bond with organizational values and the corporate brand. Administration and analytics module: This module ensures comprehensive content management, parameterization of operating rules, and monitoring of user activities. Fuel Station Ville is a development tracking system that will enable employees to follow up on their development and acquire knowledge about several topics on BP and GBS Europe. The goal of Fuel Station Ville (FSV) is to provide an outstanding, one of a kind employee value proposition (EVP), which brings BP-GBS a competitive advantage both internally and externally and meets the expectations of the newest generations of employees. We implemented and customized the learning platform to completely transform the traditional onboarding process of Magyar Telekom and T-Systems. The system provides all crucial organizational information that new hires to the company need to be aware of: company history, product and service information, rules and policies, corporate strategy. Multipoly presents the multinational accountancy and consultancy firm PricewaterhouseCoopers operating in Hungary. Players of the virtual simulation participate in the online world of PwC starting with their job interview and working as virtual employees in the different operations of the company with different objectives defined for each area. The unique gameplay was created by the communications agency MarkCon.